Have a wedding blog? Talk about wedding, bridal, wedding ceremony, wedding tips, and many more? Maybe this template is suitable for you.Simple color, with beautiful woman on wedding dress, 3 columns layout. Dont forget to back up your template before change it. Planning a wedding, for most brides, is often wracked with stress. Many of the factors that play a role in weddings are sensitive issues, especially money, family, and traditions. this is a great template. I may need it soon for another photo blog. I appreciate it very much! Fabulous and superb post on fashion related terms. Wedding dress is really beautiful. I'm glad to read this great review. Let me share with instant insurance that is provided by major insurance companies. Customer could save on instant auto insurance rates which allow you to obtain cheap policy. Published the wedding dress on the site because in the site is grateful and more interesting that can be shared everything else. So lovely and more interesting weeding dress so nice and more enjoyable dress so that can be enjoy it. Mostly are very like it. 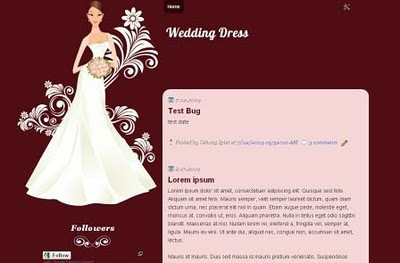 Define the weeding dress and more enjoyable dress so that can be enjoy it in this blogger and more lovely blogger can be enjoy it in this template. In this blogger shared the different types wedding post so that can be know that and able to understand and purchasing in this types dress so very well. Generally I don’t learn post on blogs, but I would like to say that this write-up very compelled me to check out and do it ! Your writing style has been surprised me. Thanks, very nice post. Improves muscle tone and gets you out of the house.tory burch wallet Add a pair of Mbt shoes to the equation and many of the benefits are magnified. Most of the people are very like it in this blogger because in this blogger so very well and fantastic for all of them so that can be enjoy it in this wedding dress. There are different types color ,size and more fantastic blogger shared on the site so that can be enjoy it in this blogger . Mostly people are very like it and enjoy it in this dress.